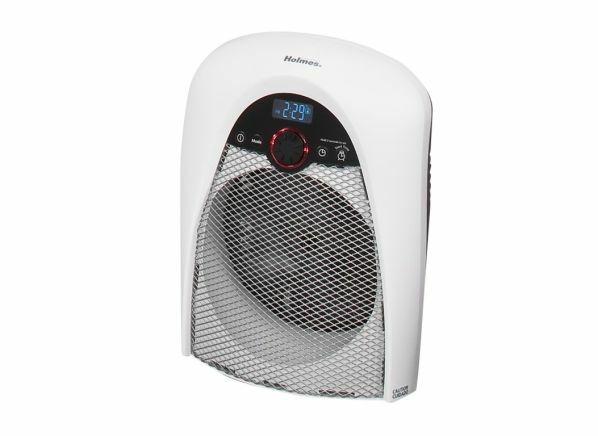 The Holmes HFH436 is part of the Space heater test program at Consumer Reports. In our lab tests, Space heater models like the HFH436 are rated on multiple criteria, such as those listed below. Output: Output is based on the manufacturer's stated wattage rating which was verified during testing. Room heating: The effectiveness of a heater to heat a standard-sized room, such as a family room, in 15 minutes. Spot heating: The effectiveness of a heater to directly heat an individual sitting in a room in 15 minutes. Weight (lbs.) Weight Weight of the heater, to the nearest pound. Tip-over safety switch Tip-over safety switch Tip-over switch indicates that a model is equipped with this safety feature, which shuts down the heater when it is knocked over. Fan Fan Indicates that the heater has a fan for faster distribution of the heat generated. On some models, the fan can operate without heat for cooling. Remote control Remote control A remote control for multimedia. Oscillating Oscillating Indicates the heater swivels from side to side for broader heat distribution. Warranty Warranty The length of time in years the heater is covered by its manufacturer for defects or repairs. Multiple fan speeds Multiple fan speeds Indicates heaters that have more than one fan speed for better control of the heat distribution. Timer Timer Allows you to program when a heater turns on and/or off. Most models can be set for on and off, some only for off. Clock Clock Not only indicates the time of day, but also allows the heater to be activated or turned off at a specified time. GFCI GFCI For Ground Fault Circuit Interrupter, it’s a specialized plug at the end of the power cord designed to protect from electrical shock by interrupting a household circuit when it detects a potential shock hazard. Either a GFCI plug or wall receptacle is necessary around water, such as in bathrooms or kitchens, where the chance for electrical shock is greater. Wheels Wheels Indicates that the heater comes with a set of wheels for easier movement. It generally matters with models heavier than 10 pounds.